The Palazzo Pubblico is a large building with a high tower on the central square Piazzo del Campo in Siena (Tuscany, Italy). It has been the town hall of the city for many centuries. For tourists, two things are especially interesting: On the one hand, the corridor to the tower Torre del Mangia with a great view. On the other hand, the visit of the palace with the city museum Museo Civico with famous wall paintings (frescos). The Palazzo Pubblico has two entrances. To the right of the building is the Town Hall. The building is still the Town Hall of Siena. To the left, at the front of the palace, is the tourist entrance. You enter a large room. Straight ahead is the ticket office, on the right there is the museum and on the left there is the staircase to the tower. 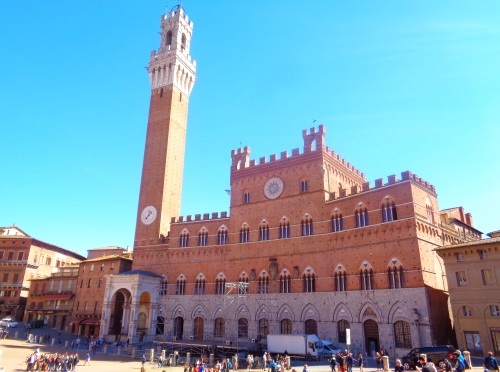 It goes up more than 400 steps, the town hall tower of Siena is 102 meters high. 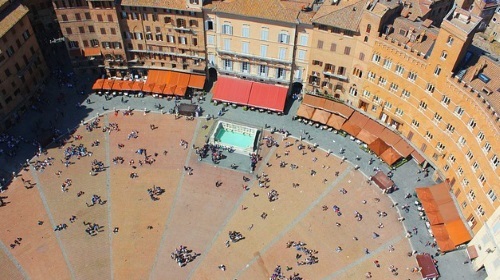 From the top you have a great view of Piazza del Campo (see picture below), Siena and the surroundings of the city. The tower Torre del Mangia was built in the 14th century and was for a long time the highest tower in Italy, which was not a church tower. The Torre del Mangia and the steeple of the cathedral, about 200 meters away, are exactly the same height. Already at that time, people wanted to express the separation of powers between church and state. The Torre del Mangia was finished after approximately 10 years of construction in 1358. The non-church town hall tower has like a church tower a clock and bells. The Palace Pubblico is directly on the central and largest square of the city (Piazza del Campo). The famous Cathedral is about 200 meters west (further left on the map). At the great time of Siena, the 1st floor of the Palazzo Pubblico was the important government rooms. It was here that important meetings were held and where major decisions were made. Today this first floor is a museum. The Museo Civico is famous for some frescoes on the walls. Great Picture: Good government and bad government: In the rearmost room of the museum, the so-called „Room of the Nine“, frescoes are painted on three walls on the theme of good and bad governments. Sala del Mappamondo (Room of the World Globe): A large globe used to be here, but unfortunately it is no longer there. Very famous is a picture with the riders Guidoriccio da Fogliano. No less interesting is the picture „Modonna on the throne with child“ by Simone Martini on the other side of the largest room in Palazzo Pubblico. Visitors to the Museo Civico can go one floor higher. You are at a viewing terrace or loggia with a good view to parts of Siena and the surrounding area. The museum costs 9 Euro entrance fee, for the ascent of the tower you have to pay 10 Euro. There is a combined ticket (Torre des Mangia, Museo Civico and Museum Santa Maria della Scala) for the entire entrance fee of 20 euros. Children under the age of 11 do not have to pay admission. There are family tickets (e.g. the combi-ticket above 2 adults with children 40 euros). It is open almost every day of the year, only on very important holidays like Christmas the palace closed for public. Tower: In the summer the opening hours are from 10 to 19 o’clock, and in the winter (about mid-October to end of February) from 10 o’clock to 16 o’clock (in 2018 and 2019). Museum: open from 10 a.m. to 7 p.m. in summer and from 10 a.m. to 6 p.m. in winter. If you have a combi-ticket: The „Santa Maria della Scala“ has a day off on Tuesday.